Dave Celentano Rock Around The Classics PDF + Mp3 CD download. 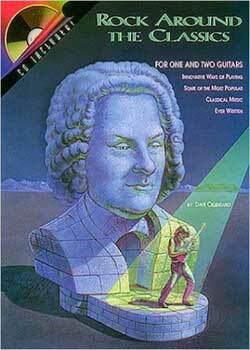 This book/CD pack introduces guitarists of all levels to fresh and innovative ways of playing some of the most popular classical songs. The songs are in order from easiest to most challenging, and a lesson is included on each. There are very few guitar tab-tutorial books out there that show you how to play classical music in the proper ‘shred’ guitar style – I.E. with technical, lead guitar techniques such as fast alternate picked runs, elaborate tapping sequences, crazy legato etc. Usually, if you want to play some classical themes in the metal-guitar style, you either have to transcribe something yourself from the original classical performance or copy what someone else, such as Yngwie J. Malmsteen has done before. Rondo “Turkish Dance” by Mozart, for example, is shown here played with slick alternate picking, high up the neck. Bach’s Toccata & Fugue is here shown to be played with some more alternate picked runs and plenty of crazy multi-finger tapping sections. The techniques required are given good explanations by the author, who also links them i with other guitarists who have made them popular, such as Eddie Van Halen’s trem picking. This book will SERIOUSLY improve your technical ability on your axe. If you already have Troy Stetina’s Speed Mechanics, then i’d say that this is tech next step up. Also comes with a great CD letting you hear how it should all sound. Download Dave Celentano – Rock Around The Classics PDF free and other books from our site. Only high quality PDF scans. Please write a review, it's important for our community.